Book any 2018 reservation and get 2 free General Admission Passes to the 2018 Mountain Home Music Festival! This Monaco Diplomat DFT Class A Motorhome For Sale features a Diesel Engine w/Exhaust Brake which gets between 7-11 MPG, has an overall length of 43 feet, and sleeps 7 people. This Coachmen Encounter 36BH Class A Motorhome For Sale features a Gasoline Engine which gets between 7-11 MPG, has an overall length of 36 feet, and sleeps 8 people. This Winnebago Forza Class A Motorhome For Sale features a Diesel Engine w/Exhaust Brake which gets between 7-11 MPG, has an overall length of 36 feet, and sleeps 6 people. This Forest River Georgetown Bunkhouse Class A Motorhome For Sale features a Gasoline Engine which gets between 7-11 MPG, has an overall length of 35 feet, and sleeps 10 people. This Fleetwood Bounder Class A Motorhome For Sale features a Gasoline Engine which gets between 7-11 MPG, has an overall length of 35 feet, and sleeps 7 people. This Thor Miramar Class A Motorhome For Sale features a Gasoline Engine which gets between 7-11 MPG, has an overall length of 35 feet, and sleeps 8 people. 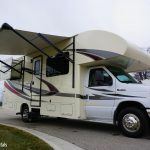 This Jayco Greyhawk Class C Motorhome For Sale features a Gasoline Engine which gets between 7-11 MPG, has an overall length of 31 feet, and sleeps 10 people. This Jayco Redhawk Class C Motorhome For Sale features a Gasoline Engine which gets between 7-11 MPG, has an overall length of 31 feet, and sleeps 7 people. This Jayco Greyhawk Class C Motorhome For Sale features a Gasoline Engine which gets between 7-11 MPG, has an overall length of 29 feet, and sleeps 8 people. 29′ Thor Ace Luxury Class A RV Rental Full Wall Slide! This Thor Ace Class A Motorhome For Sale features a Gasoline Engine which gets between 7-11 MPG, has an overall length of 29 feet, and sleeps 7 people. This Jayco Redhawk Class C Motorhome For Sale features a Gasoline Engine which gets between 7-11 MPG, has an overall length of 29 feet, and sleeps 7 people. This Thor Freedom Elite Class C Motorhome For Sale features a Gasoline Engine which gets between 7-11 MPG, has an overall length of 29 feet, and sleeps 8 people. This Fleetwood Jamboree Class C Motorhome For Sale features a Gasoline Engine which gets between 7-11 MPG, has an overall length of 25 feet, and sleeps 6 people. This Itasca Navion Class B Motorhome For Sale features a Diesel Engine which gets between 14-16 MPG, has an overall length of 24 feet, and sleeps 4 people. This Jayco Melbourne Class B Motorhome For Sale features a Diesel Engine which gets between 14-16 MPG, has an overall length of 24 feet, and sleeps 6 people. This Jayco Redhawk 23 Class C Motorhome For Sale features a Gasoline Engine which gets between 7-11 MPG, has an overall length of 23 feet, and sleeps 6 people. This Coachmen Leprechaun Class C Motorhome For Sale features a Gasoline Engine which gets between 7-11 MPG, has an overall length of 19 feet, and sleeps 10 people. This Heartland Fuel 287 has an overall length of 36 feet, has a dry tow weight of 8760 lbs., and sleeps 8 people. This Jayco JayFlight has an overall length of 29 feet, has a dry tow weight of 6500 lbs., and sleeps 9 people. This Jayco Jayflight 29 QBS has an overall length of 29 feet, has a dry tow weight of 6991 lbs., and sleeps 8 people. This Forest River Cruise Lite has an overall length of 26 feet, has a dry tow weight of 5854 lbs., and sleeps 8 people. This Jayco Jayflight 26BH has an overall length of 26 feet, has a dry tow weight of 4700 lbs., and sleeps 8 people. This Keystone Outback has an overall length of 24 feet, has a dry tow weight of 4935 lbs., and sleeps 7 people. This Outdoors Timber Ridge has an overall length of 24 feet, has a dry tow weight of 6350 lbs., and sleeps 6 people. This Jayco Jayfeather has an overall length of 23 feet, has a dry tow weight of 4710 lbs., and sleeps 4 people. This Skyline Aljo has an overall length of 20 feet, has a dry tow weight of 2950 lbs., and sleeps 4 people. This Forest River Viking has an overall length of 17 feet, has a dry tow weight of 3200 lbs., and sleeps 6 people. This Palomino PaloMini has an overall length of 15 feet, has a dry tow weight of 2597 lbs., and sleeps 4 people.